Working with a broad range of technology groups and IVD development groups within Thermo Fisher Scientific, we are part of the end-to-end companion diagnostics development and commercialization solution with pharmaceutical partners, from feasibility study, to clinical trial assay development and validation, to IVD development. We leverage our team’s clinical experience to develop assays and workflows for clinical lab customers, to enable a successful experience of CDx products in customers’ hands after launch. 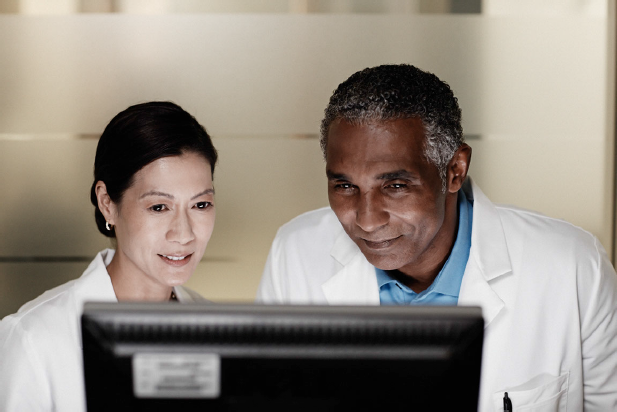 We have core expertise in optimizing workflows and assays on challenging clinical samples. We select technologies and products that are most appropriate for small samples. In development and validation, assays are optimized to generate results on most small and challenging samples. Our lab deploys multiple technologies in an end-to-end oncology workflow, including histology, pathology, FISH, qPCR, Sanger sequencing, and next-generation sequencing (NGS). Genomics plays an essential role in oncology drug discovery and companion diagnostics development. The Oncomine® Cancer Research Panel and workflow is a fast, easy-to-use next-generation sequencing tool enabling the analysis of hundreds of genes in a single run, providing a universal solution for drug and companion diagnostic development efforts. The Oncomine® Cancer Research Panel and workflow are optimized on small specimens by our team using various technologies and products including the Ion PGM™ Sequencer, Ion AmpliSeq™ Panels, Ion Reporter™ software, Oncomine® Knowledgebase, Ambion® RecoverAll™ extraction kit, and AcroMetrix® controls. The assay is validated under CLIA guidelines using FFPE samples across different tumor types and cell lines. To discuss information on the performance of the assay from our validation, please contact us. We provide custom assay development and validation services to pharma customers using multiple technology platforms (FISH, qPCR, Sanger sequencing, and NGS), custom design, and existing validated panels. To order Oncomine® Cancer Research Panel services or custom assays, please contact us.